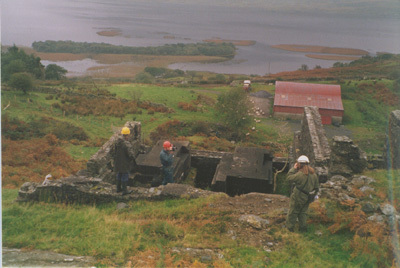 This mine is located in the heart of Connemara, above the village of Maam. This was originally worked in the 1800s, for which there are few records, and later re-worked in 1908. On the site, however, the surface remains provide visible signs of different workings. The processing mill, which is large and impressive, is quite prominent and overlooks Lough Corrib. It is in a fine condition and is well worth preserving. It seems likely that it was powered by a pelton wheel arrangement as there is evidence of a leat going from the stream which would have worked the wheel and driven the crushers. Above this is an incline plane, with a partly intact brake drum housing at the top. Another incline continues down past the mill to the remains of a wooden pier on the Lough. At the top of the first spoil tip, and cutting across the stream, an open adit is found. This is about 2 metres wide and appears quite modern, running straight in for about 200 metres. 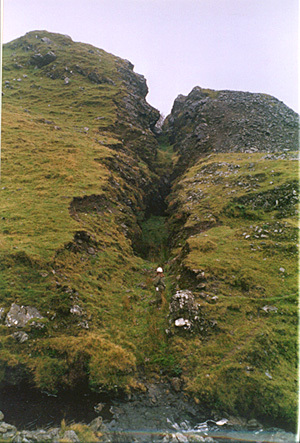 At this point, a branch passage to the right runs about 350 metres and has a small cross cut with a possible rise which was not climbed due to loose rock. The tip higher up comes from the open cut stopes to the right of the stream. A small adit below the cut is blind after 20metres and care should be taken crossing a sump in the passage. On the opposite side, another short level has been driven and there is also a collapsed adit a little further up the hill. The tip here is quite surprising and a large amount of unprocessed galena can be found. This probably dates from a more modern time because the tip material had been dumped across the original incline. There is also a report about a boat full of ore, which sank in Lough Corrib on route to Galway and is still thought to be there.